Tripp Lite's Power It! 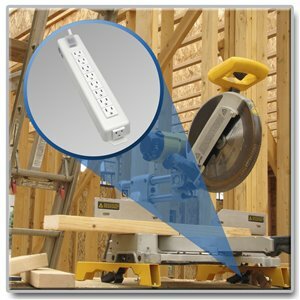 TLM915NC power strip offers reliable, convenient and cost-effective power distribution for appliances, power tools, lighting and other electrical equipment. Includes 9 NEMA 5-15R outlets (including one end-mounted outlet ideal for accommodating a transformer without blocking other outlets), 4.57 m (15-ft.) AC power cord and keyhole mounting slots. Multi-outlet strip reduces cable clutter and enables the connection of multiple electrical devices to a single AC wall socket. Features rugged metal case to stand up to the most demanding environments, illuminated power switch with transparent cover to prevent accidental shutoff and 15A integrated circuit breaker to prevent dangerous overloads. Have convenient, cost-effective, reliable electrical service where you need it with Tripp Lite’s TLM915NC Power It! Power Strip. Featuring nine outlets, 15A service and keyhole mounting installation, the TLM915NC is ideal for distributing power to appliances, power tools and lighting equipment. Its rugged, all-metal housing is designed to withstand the rigors of even the most demanding environments. You’ll never have to worry about lack of available outlets with the TLM915NC. With a length of less than 14 inches, the TLM915NC fits a row of eight outlets on the top of the unit, plus an extra outlet located on the end of the unit to accommodate a bulky transformer. Install the TLM915NC far away from its power source and distribute power to previously un-powered areas with its extra-long, 15-ft. power cord. The TLM915NC can be mounted in a different area—or a completely different room—from where it draws AC power, putting you in control of getting reliable power service where it’s needed most. The TLM915NC’s lighted On/Off switch with translucent cover shows the unit’s operation at a glance and eliminates the possibility of an accidental shut-off. A built-in, 15A circuit breaker prevents dangerous circuit overloads that could damage equipment by immediately shutting off AC input when it detects that the equipment load is drawing too much power. The TLM915NC is backed by a lifetime warranty. As part of Tripp Lite’s commitment to environmental responsibility, it is manufactured in compliance with strict RoHS specifications.